When the overnight security guard of Costco is mysteriously killed in what can best be described as unusual circumstances, Evan takes action; he forms another club. This one is a neighborhood watch; a motley crew of four guys whose principle reason for getting together is based less on watching the neighborhood and more on drinking beer and socializing throughout the night. 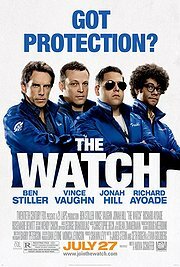 But when even more bizarre occurrences happen – more killings, lots of green, sticky goo left at the murder sites, and the discovery of what can only be described as alien weaponry – the neighborhood watch team are forced to become an extension of Ghostbusters, four ordinary guys ridding the world of vermin, one alien at a time. The best thing to say about The Watch is that it has its moments. Occasionally, just occasionally, the film delivers a big, unexpected laugh, a moment of genuine comedic inventiveness that gives you hope for more to come, then it falls back on the usual adolescent vulgarities. When the Neighborhood Watch discovers that the weakness of an alien is to point the gun at a certain intimate part of its scaly anatomy – you’re ahead of me already, I can tell – you feel the script was written by a very naughty schoolboy whose idea of humor consists solely of potty-mouthed vulgarities and poo-poo jokes. The script was actually written by actor, Seth Rogen. The four actors who make up the Watch are good together. Both Ben Stiller and motor-mouth Vince Vaughn appear to have been given the freedom to ad-lib and do what they do. With Stiller it’s to act overly fussy followed by embarrassment. With Vaughn it’s to run continually at the mouth, an act that can often be funny, but without directorial discipline – which appears to be the case in some scenes – it can also be too much. Jonah Hill’s dead pan delivery as Franklin, a young man with so many emotional problems that even the local, bumbling police department turned him down, makes a lot of his silliness appear funnier than it might on the printed page. And finally, there’s British comedian of Nigerian descent, Richard Ayoade as Jamarcus, an interesting and colorful fourth member of the Watch who attracts attention not just because of his cultured sounding English accent but because of his slightly oddball look. Product placement in movies is one thing, but The Watch actually makes a character out of Costco. For all the faults within the script the one thing that can be said in its favor is that, at the very least, it makes Costco funny. The aliens favor stealing their supplies at Costco because, as Jamarcus explains, it has everything they need under one roof. Stiller responds with a lock and load attitude and declares that the Watch need to get the aliens out of the shopping warehouse because, “… Costco is for members only!” For all of its juvenile humor, you have to admit – that’s funny.